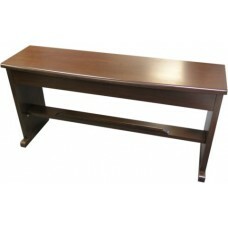 The Studio Organ Bench is an affordable option for organ workstations in home and hobby environments. The bench is finished with a walnut-stained wood-veneer to match our popular MIDI pedalboard. The bench is sufficiently wide to accommodate AGO standard pedalboards. To reduce shipping costs, the unit is flat packed and requires assembly. A Phillips screw driver and hammer are all that is required. The Studio Organ Bench is intended for light duty home and hobby use. The unit is not designed for regular moving, institutional, or professional use.